Last week, I went on a Carnival cruise, and I was going to write about the whole cruise and the cruise ship. However, the Carnival Triumph we sailed on is about to be removed from service to be totally refitted. It will be renamed the Carnival Sunshine and should set sail again in April. 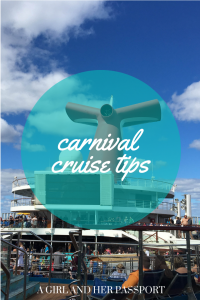 So I will be giving some Carnival Cruise Tips instead so you can enjoy any Carnival cruise! Each adult is allowed to bring one bottle of wine that is 750ml. The bottle must be brought in your carry-on, and you will have to show it upon boarding. My tip is to take it out before you get to check-in so you can quickly get through the process. Even though I brought my own wine, I did not bring a bottle opener. If I took the bottle to the dining room, they were going to charge me $14 to open it! That was more than I paid for the bottle. Someone in our group bought one on board for $10 still outrageous, but at least we could open it. Bring your own, and you won’t have either of these issues. Another idea is to make sure your wine bottle has a screw top instead of a cork. Carnival is known as the Fun Ships but should be known as the Party Ships. Every night there was a loud group of people in our hallway well after I had gone to bed. The first night, I got up and found my earplug that I never travel without. Others in my group wished they had brought some. Keep in mind this loudness is almost everywhere, especially by the main pool. The first day we left from New Orleans, it was only in the 50s, and it was very windy. It was cold on deck as well. At night the dining room was freezing. I was glad I had brought a cardigan and pants. Even the rooms were chilly, and you can only control the airflow speed, not the temperature. You can check bags when you arrive, but they don’t guarantee their arrival in your room till around 6 pm. Which, if you want to change for the early dinner, then you need to have your clothes in a carry-on. I only brought a carry-on since it was a four-day cruise, however, I could have done seven days or more in my carry-on. Of course, this depends on how many elegant nights you are planning on attending and if you like to get very dressed up for those. There isn’t much room for suitcase storage unless you put them under your bed. Having smaller bags means you can put them in the closet after you unpack. It also means you can leave the ship first when disembarking. If you check bags, you have to wait till your number is called to leave. It took me over an hour to get off at 8:30 AM, so it will probably get worse as the day goes on. The free water on the ship doesn’t taste very good, so if you are a big water drinker pre-order a package of water for your room. You can do this on Carnival’s website after you have checked-in. The pre-0rder price is much less than paying for bottles at the bars. If the taste doesn’t bother you, then bring a refillable water bottle. Many things, like the water, are cheaper if you pay for them beforehand. Internet was cheaper when purchased in advance. You can also buy drink packages at a discounted rate before the cruise. Excursions are not less expensive, but the more popular ones will sell out fast once you are on board. You can book shore excursions in advance as well online. We ordered coffee for our room every day. It was a nice treat to have fresh coffee brought to the room before we left. I am not a morning person, so I need some caffeine to face a ship full of people. Room service for basics like breakfast and coffee do not cost extra. 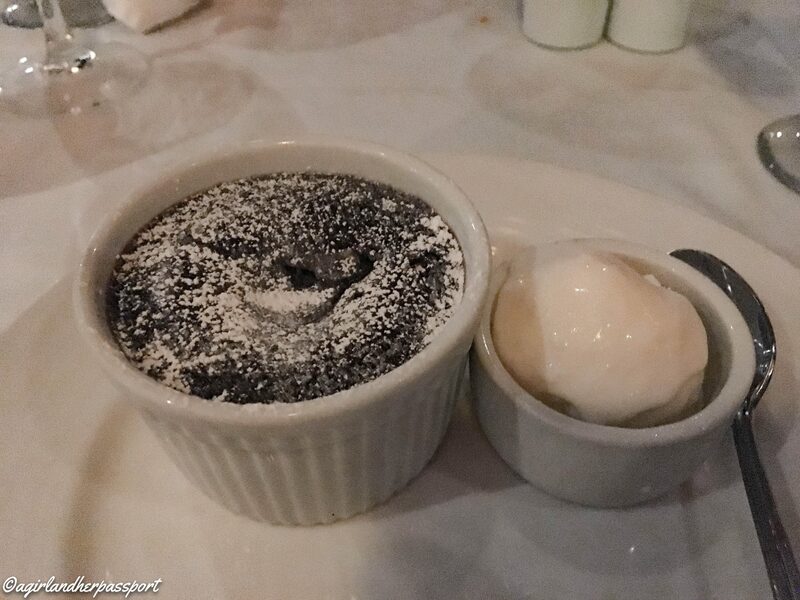 So this is more of a recommendation than a tip, but the best dessert on the ship was the melting chocolate cake. After trying it the third night, I ordered it again and so did several people at our table. The cake came in its own dish and dusted with powdered sugar. The cake is hot and is like a brownie just out of the oven with a melted center. It is served with a side of vanilla ice cream. 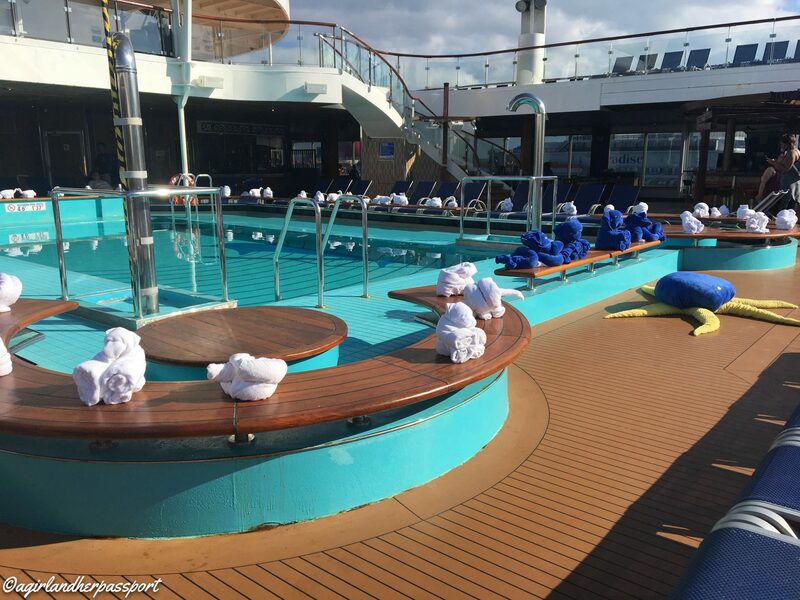 Every morning, I went to the Lido deck for breakfast. This is where they serve breakfast and lunch buffet style instead of in the dining room. At breakfast, there was a line. There was less of a line on excursion day. Just be prepared to wait. There never seemed to be a time that wasn’t busy and by the time breakfast was finished being served, lunch was being laid out. If you really need to eat on a schedule, my tip is to order room service for breakfast. 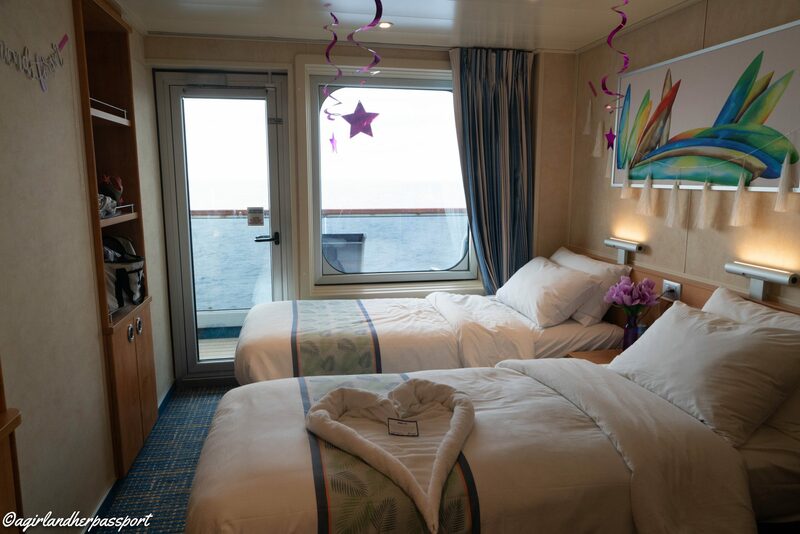 When you arrive at your Carnival cruise room, your Sail & Sign card will be outside in an envelope. This is the card that you get in your cabin with, how you pay and how you leave and return to the ship. It has a hole punched in it. By bringing a lanyard, it makes it easier to keep track of. This especially true if you have kids on the cruise with you. You can purchase a lanyard on board, but they are probably expensive. 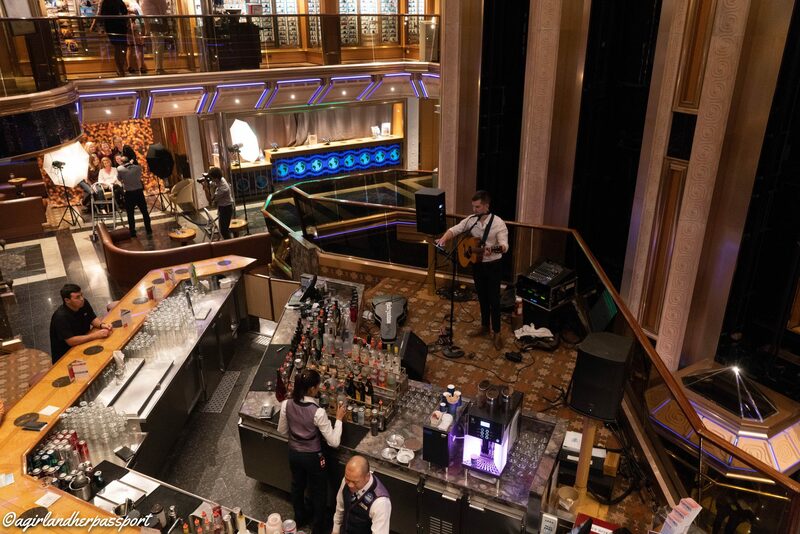 Like wine, you can bring soda on the ship. I recommend this as a Ginger Ale cost me almost three dollars! You can bring a 12 pack of soda on board per person. You will also have to have this inspected just like the wine. I think it is so you don’t sneak alcohol onto the ship with you instead of soda. You can also bring juice or milk. This is great if you are going to buy a bottle of liquor and want to have a mixer. 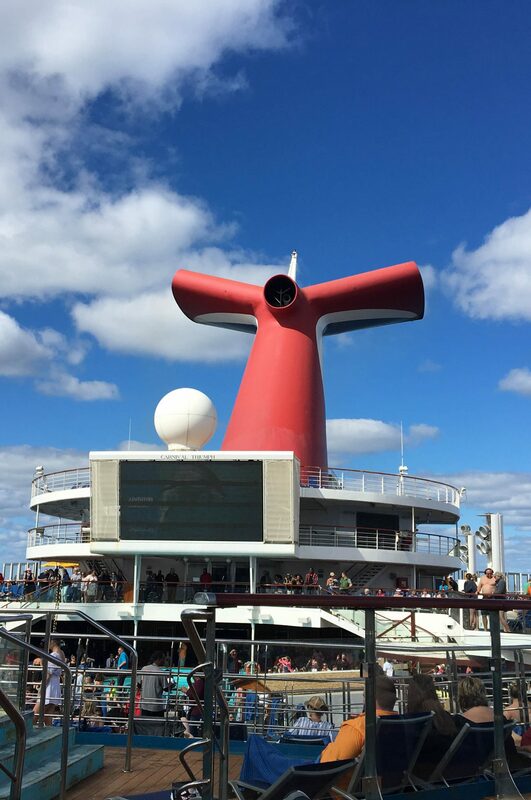 Hopefully, these Carnival Cruise tips will help you enjoy your next cruise and save you some money as well. 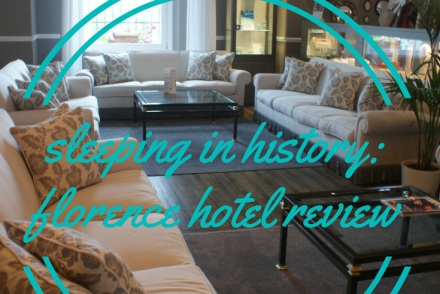 If your ship leaves from New Orleans, check out my hotel recommendation. 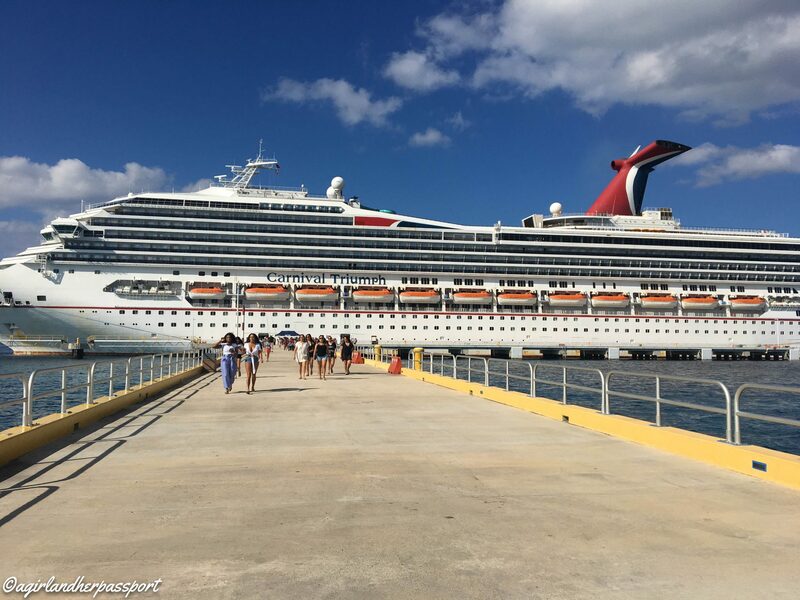 Have you been on a Carnival Cruise? What tips do you have to share? Thanks for the tips Tiffany! These kind of honest tips are so helpful for travelers. It is one of my wish to be on a cruise ship, I almost did before being an expat though but unfortunately my schedule was too tight. Anyway, that’s a good tip and probably lot’s of people like me doesn’t know about these things. Very helpful. vinneve recently posted…Destination: Munich. Unexpected. I hope you get to go on one. Thanks! !